Home » Dojo Highlights » Ki-Ai! Aikido Kids! Posted by aikidoesc on Apr 13, 2015 in Dojo Highlights, Featured, The Dojo Posts | Comments Off on Ki-Ai! Aikido Kids! When the kids shout “Ki-Ai!” during practices, we see big smiles and a look of pride on the faces of the observing family members. When the child gets a technique right, it’s such a special moment. But just as exciting as the student mastering the techniques and movements of the art of Aikido are the words we hear time and time again saying how “much calmer”, “more respectful”, “better listener”, “more self confident” that the children have become. At Aikido of Escondido, we take great care to ensure that the foundation of the martial arts form, way of harmony, is carried through and imparted to each one of the 4-to-15-year-old kids that bow in at the dojo entrance. Yes, of course, we want the student to excel at the technique. 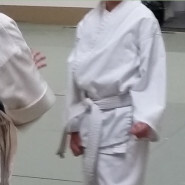 But we also find it such a joy when the beginner student remembers to first say, “Hai!” when addressed by their Sensei. There is just so something special about that little 5-year-old boy who went from unruly to unbelievably well-behaved in just a few months. They are starting to learn the “way of harmony” at a young age… and it will carry through to their adult years… and maybe even be passed down to their own children. Are you ready for your child to be on a great path of self development? Check our class enrollment page to see if openings are available. If so, please contact us or stop by the dojo to get started. If not, we do have a waiting list, so let us know you’re interested and we can contact you as soon as a membership opening comes available.